Go ahead and sign up while you are thinking about it. I'll start sending out issues the first week of October to give people time to subscribe. 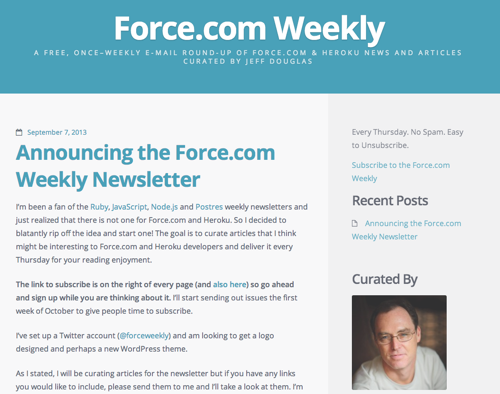 I've set up a Twitter account (@forceweekly) and am looking to get a logo designed and perhaps a new Wordpress theme. As I stated, I will be curating articles for the newsletter but if you have any links you would like to include, please send them to me and I'll take a look at them. I'm not sure the best way to collect these (spreadsheet, twitter hashtag, form, etc.) so perhaps leave a comment with your suggestions.